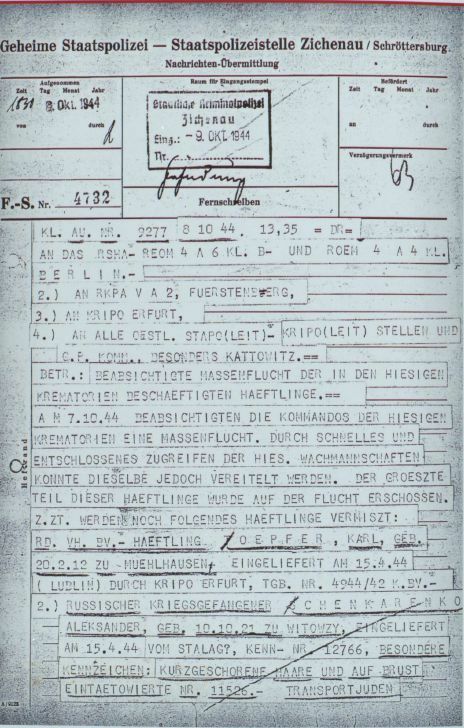 Report from the local police station Auschwitz on the escape of Sonderkommando prisoners on 7th September [correct: October] 1944. 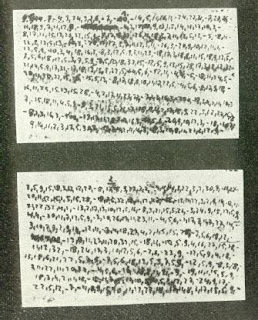 Telex from Auschwitz to police stations on the escape and shooting of crematoria prisoners on 7th October 1944. 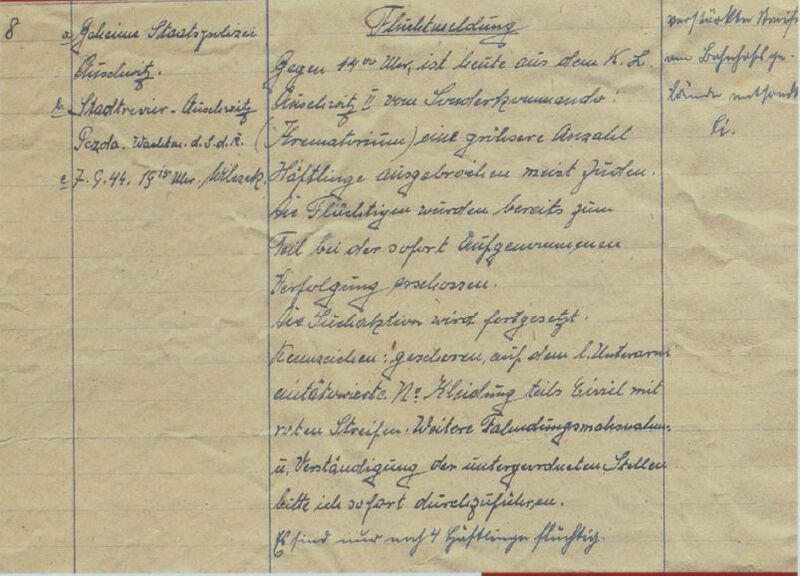 Labour force reports of 9th and 10th October 1944 on the decimation of the crematoria personnel by 451 people and inactivity of crematorium 4. 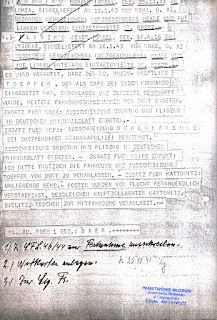 Secret camp resistance message on the 7th October 1944 Sonderkommando revolt. Sonderkommando manuscript on the 7th October 1944 Sonderkommando revolt. 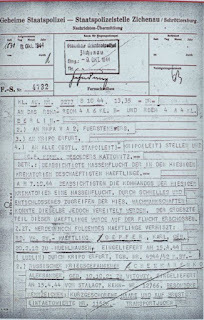 These documents are too troublesome for Holocaust Revisionism as they a) heavily corroborate the testimonial evidence and b) raise the question why the most secured detail in Auschwitz-Birkenau (see also Auschwitz Labour Force Reports as Evidence of Sinister Activity at the Crematoria) attempted a mass escape during daylight inevitable resulting into deaths among the prisoners if there was no immediate threat to them. Just don't hold your breath for Revisionists to explain this. They haven't even offered yet any sound explanation why there were up to 903 prisoners employed at the crematoria - mostly idle according to their own hypothesis - in summer 1944 to begin with. Gegen 14.00 Uhr ist heute aus dem K.L. Auschwitz II vom Sonderkommando (Krematorium) eine grössere Anzahl Häftlinge ausgebrochen meist Juden. Die Häftlinge wurden bereits zum Teil bei der sofort aufgenommenen Verfolgung erschossen. Die Suchaktion wird fortgesetzt. Kennzeichen: geschoren, auf dem l. Unterarm eintatöwierte No. Kleidung teils Zivil mit roten Streifen. Weitere Fahndungsmassnahmen u. Verständigung der untergeordneten Stellen bitte ich sofort durchzuführen. Es sind nur noch 4 Häftlinge flüchtig." Today around 14 o'clock, a large number of prisoners escaped from concentration camp Auschwitz II from the Sonderkommando (crematorium), mostly Jews. The prisoners were partly shot during the immediately started chase. The search operation is continued. Characteristics: close-cropped, tattooed number on the left forearm. Clothes partly civil with red stripes. Further manhunt measures and communication to the lower offices is requested. There are only four prisoners on escape left." 4.) Pliszko Meier Israel, geb. 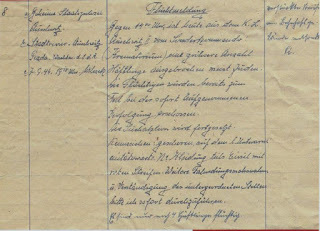 16.4.1916 zu Wysokie, eingeliefert am 16.1.43 vom RSHE [sic], o. AZ besondere Kennzeichen: kurzgeschorenen [sic] Haare und auf linkem Unterarm eintaetowierte Nr. 88675.-"
"Re: Intended mass escape of the prisoners employed in the local crematoria. Rd. Vh. Bv. 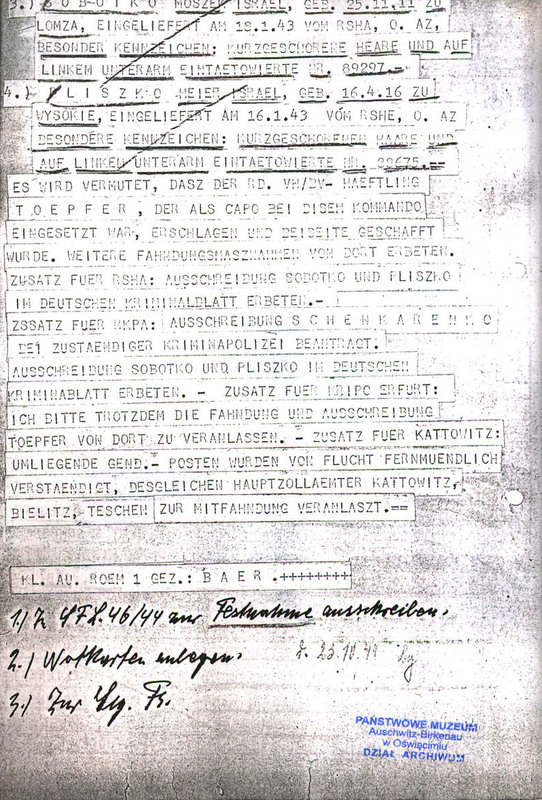 prisoner Töpfer, Karl, born 20 February 1912 in Mühlhausen, admitted on 15 April 1944 (Lublin) by criminal police Erfurt, reference number 4944/42 K.Bv. 4.) Pliszko Meier Israel, born 16 April 1916 in Wysokie, admitted on 16 January 1943 by the RSHA, without reference, special characteristics: close-cropped hair and tattooed number 88675 on the left forearm.-"
60-B. Heizer Krematorium IV. Tag [...] 72"
60-B. Heizer Krematorium IV. Tag [...] 26"
60-B. Heizer Krematorium IV. Tag [...] 33"
"9 October 1944. On Saturday the 7th, the Sonderkommando employed for the gassing and burning was supposed to be gassed. It did not came to the gassing, because the desperate prisoners, when they saw the unavoidable death in front of their eyes, threw themselves on the SS, killed six of them and forced their way through the chain of guards. About 200 were shot during the escape, about 500 have rescued themselves. One of the crematoria was set to fire. The overflying air planes due the air raid on Silesia made the persecution more difficult. At the moment, the SS is publicly threatening with bloody revenge on the prisoners, as they consider it an outrageous crime that the unfortunate prisoners did not allow to let themselves gassed. Berlin was informed about the matter in a special report [...]"
Wir werden den gefallenen Kameraden stets ein treues Andenken bewahren." We will always remain true to the memory of the dead comrades." "7/10 460 m rozstrzelac [?] Sonder"
"7 October 460 m[ale] shot Sonder"
"But on the next day, i.e. on Saturday morning, 7 October 1944, we learnt that a transport with these 300 people from crematorium IV-V should leave. For the last time, we reinforced our positions and informed the people we had contact with how they should behave under the various circumstances. When it was 1:25 pm and they came to get those 300 people, they showed great courage as they did not want to move. They rose with a load cry and threw themselves with hammers and axes on the guards, wounded some of them, beat the others with what they could get and threw stones on them. One can easily imagine, what was the result of this. Moments later a whole battalion of SS arrived armed with machine guns and grenades. There were so many, that there were at least two machine guns against each prisoner. Such an army they mobilised against them. As our people saw that they were lost, they wanted to set fire to crematorium IV and to die in action, in the hail of bullets at this place. And so the whole crematorium ended up in smoke. When our detail at crematoria II-III saw the flames from the distance and heard the shooting, it was convinced that nobody was alive from this detail." Hey Hans, I know you've had some dealings with Nicholas Kollerstrom in the past, so I thought you might want to see this. It pretty much wrecks his credibility to the point that anything he says can be dismissed offhand. Thanks, that's definitely something to highlight also here at this blog.